A new report from Navigant Research shows that electric vehicle(EV) sale surpassed 1 million in 2017, according to a press release. 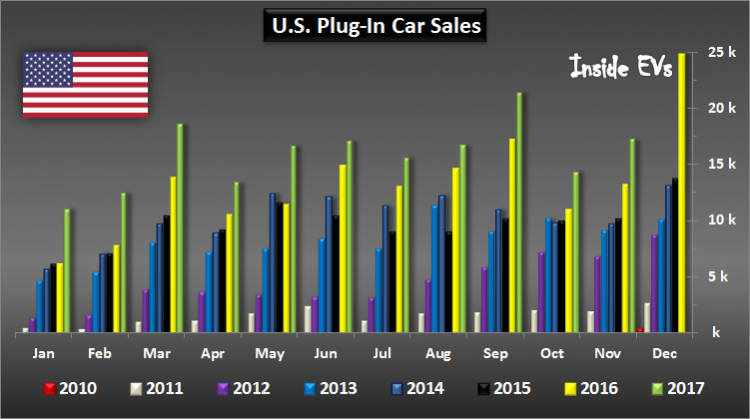 Recent developments in the plug-in electric(PEV) market, including the rollout of long-range battery EVs (BEVs) at sub-$40,000 price points, have positioned the segment for robust growth. Since PEVs were introduced in 2011, sales have experienced annual growth of 40 per cent or more, and continued growth is expected. “Battery costs have shrunk dramatically in the last five years and promise to shrink further with the commercialization of solid-state batteries on the horizon,” says Scott Shepard, senior research analyst with Navigant Research. While most of the global market can expect robust growth in the near term, the outlook in the United States is less certain based on the potential for federal level policy changes. For the last 3 years EV sales have increased substantially in the United States and worldwide, they are still only 1 per cent of global demand. Worldwide sales for 2016 was 777,497, and in 2017 worldwide sales for EV’s was 1,039,988. “In addition, increasing regulatory pressure in Europe and China may well push the PEV market to the aggressive end of the forecast range regardless of oil prices” said Shepard. According to the report, if US fuel efficiency policies and government subsidies are relaxed or removed, the country will find it difficult to keep pace with other markets.